1. Use garlic or pepper: One of the best natural methods to keep away rodents from your garden is to use natural repellents. In the case of squirrels, you can make a decoction of either garlic or hot pepper. Dilute the mixture and spay it lavishly on your garden plants. Re-spray the mixture once a week. The strong smell will prevent squirrels from coming near the plants. 2. Use enclosures: Another method to keep away the intruders is to fence your plants. You can use a plastic fence, a wooden barrier or a wire mesh to protect your plants. Enclosures should cover the plants completely. Remember that squirrels can climb over fences with no top covering. You can also use electric fences. 3. Use cage traps: Specially made squirrel cage traps are available in most pest-control shops. Squirrel cage traps are larger than the usual kind we use for mice. You can use nuts, fruit slices or bacon as baits. Planting multiple cage traps at different spots in your garden will help a lot. 4. Bring home a cat or a dog: Cats and dogs are good predators that can reduce the nuisance of squirrels in your home. Bring a new pet to your home and leave it loose in the garden. 5. 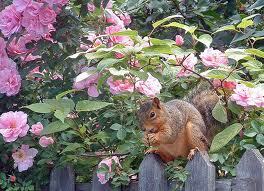 Make the garden less squirrel-friendly: Open sources of water, shady spots to hide etc. make the garden squirrel friendly. To begin with, you may remove or enclose such water sources. You can also provide alternative food to the squirrels so that they won’t be lured by your crops. Try out these tips and make your garden squirrel-free! Visit wildliferemovalburlington.ca for more information.